Seafood is one the main components of Chinese cuisine. From everyday seafood like fish and prawns to rarer meats like oysters and abalone, Chinese love their seafood! Many rice and noodle dishes use seafood as their main points of flavour. With the wide variety of dishes in Chinese cuisine, even seafood dishes hold a huge range of different foods. Here are some of the most popular seafood dishes in Chinese cuisine! 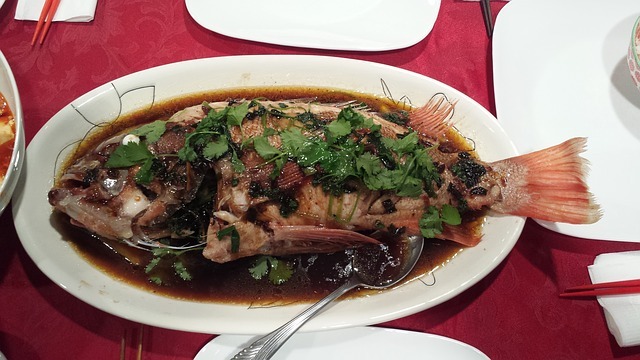 Steamed fish is a staple dish which is on the menu of most Chinese restaurants. The taste of the dish can vary depending on the sauces and the fish used. However, it should always have a soft texture that you hardly have to chew! Steamed fish is traditionally cooked with ginger for a fragrant effect. This incredible food involves cooking thin rice noodles with a crab to create an amazing flavour through the whole dish. The soft meat of the crab and the stringy, sometimes spicy noodles it is served with create a great texture and mouthwatering flavour. Although you’ll have to pick out the meat from the shell, the taste of the crab is worth it! You’ve heard of sweet and sour pork, but what about fish? The texture of fish gives this dish an entirely different feel. The soft tender meat of the fish is paired with a more liquid-like sauce to give this dish the right combination of textures. This is a great dish to order to with a bowl of rice, to share with a group of people! Black bean sauce is a great flavour to pair with seafood. One of the great things about seafood is its differences in texture – clams bring a great, chewy texture to the dish that goes well with the black bean sauce. The fermented sauce is strong in flavour and best served with something with texture to balance out the taste. It should be paired with rice to balance the flavour! Deep-fried salt and pepper squid is a common Chinese street food that tastes great. Squid meat is deep fried with batter that is seasoned with salt and pepper to create a punchy flavour. This dish is a great take on fried chicken without the troublesome bones! Nowadays, it is also common to have salt and pepper soft shell crab and other variations.